How do you fancy being an artist, a creator, who has sold more than 7 million copies of books of your black and white drawings? Nice huh? Average photobook is printed in runs of 1,000. But black and white drawings for adults to colour? Seven Million. Count them. Scottish artist Johanna Basford has done just that. Since leaving her art studies she’s has gone on to become a hugely successful artist and creator of books such as ‘Lost Ocean’ and ‘Secret Garden’. 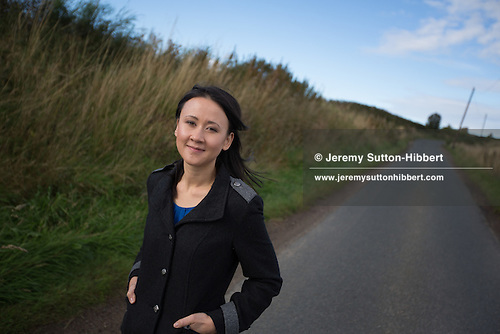 I recently paid a visit to her studio, north of Aberdeen, Scotland, for a portrait shoot for The Times (who have run the resulting image today). The photography brief for the shoot was to get a nice portrait, lit, from in Johanna Basford’s studio, something which could work on a cover and inside. And also to get an alternate shot. The studio was clean, bright, nice, a bit of a god-send really. Trouble was the ceiling was angled and very low, made putting up a softbox on a stand a little tricky, but not the end of the world. I shot a few portraits, a few variations, making sure to get the studio feel and some of Johanna’s drawings. 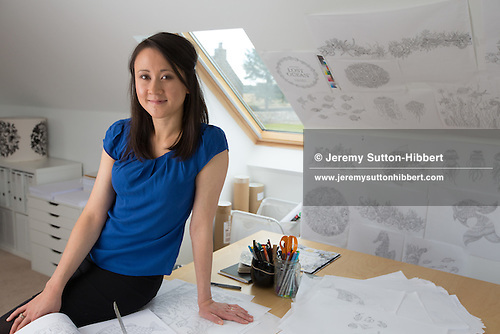 Johanna Basford in her artist studio, in today’s The Times. Then we nipped outside, into the glorious landscape which inspires a lot of the details in Johanna’s work and books. This shot was pretty much the last I shot, as we walked back towards her farmhouse studio, something more candid, something a little more loose to give the picture editor options of feel and style. See the full set of photographs of Johanna Basford, artist and illustrator.